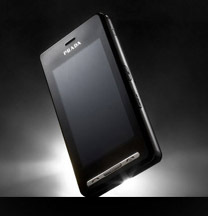 The Prada Phone by LG - How Will I Convince My Girlfriend to Buy a BlackBerry Now?! For the past year I have been trying to get my girlfriend Erika to buy a BlackBerry Pearl or the new 8800 when it hits the market. For the first 6 months the answer to my pleas was a flat out NO. But over the past few weeks, mainly thanks to my annoying non-stop talk of the upcoming launch of crackberry.com, her NO's turned into MAYBES and I could tell by next week the answer should be a YES. But yesterday, the unthinkable happened. She discovered the Prada phone by LG. It was announced on January 18th, 2007, so it was sort of old news to me (read the official press release here), but it was news to her when she saw it online, and I knew the moment her eyes fell upon that PRADA logo that my mission just failed. So RIM, if you're listening, can you please get your business development team working on a deal with Versace or Louis Vuitton. Until then, I think you will be losing out on the business of at least one potential customer and I'm sure she's not the only one out there who values fashion as much as high-tech gadgetry.